He is a firm believer that schools are a major part of the reputation and attraction of a city. "As a Richmond City Council member I see myself leading efforts, policies, and mobilizations that respond to Richmond's many educational needs that are not satisfied by the School Board." The theme of his campaign will be to a make Richmond a city for children. Promoting a "Richmond Tutors" program, recruiting tutors, and connecting them to students. Organizing "Richmond Learns from Richmond" Sharing the stories of our people. Bringing "El Systema" the now world famous music program developed in Venezuela to Richmond. Providing expanded learning opportunities to prepare Richmond's children for the new jobs and new economy. Eduardo is President of the Richmond Chapter of the Mexican American Political Association (MAPA) and a former Steering Committee member of the Parent Leadership Action Team (PLAN). Last week we introduced our new 3-in-1 door hanger, promoting the re-election of Gayle, and election of Jovanka and Eduardo. It has turned out to be very popular. You can view the door hanger (click here) and come by the office to pick them up. This week we have a new 3-in-1 piece in Spanish. Come by the office on Saturday or next week and get some of these. Volunteer in the office. The office is open at least 2pm -5pm weekdays. Usually more hours. Call the office 510-412-2260 to make sure. Two decades ago Bill McKibben was the first to warn us of global warming in his book "The End of Nature". We didn't listen or act on his warnings and as a result we find ourselves on what McKibben calls Eaarth. 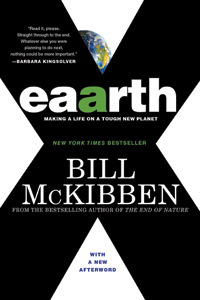 Eaarth, the name of McKibben's new book, is the new planet we now inhabit. In Eaarth, McKibben explains quite clearly that we no longer live on the same human friendly planet we once did. Ice caps are melting, oceans acidifying, glaciers disappearing, and species loss is worse than at any time in the last 65 million years. Climate change is already here. Our new planet requires us to act in an entirely new way. No longer can perpetual growth continue to be our mantra. The new planet requires us to hunker down, to figure out what we really need and what we can do without. Clearly overconsumtion is not a lifestyle compatible with our new reality. Oh, and one more thing, we're in more than a bit of a hurry to make the changes we need to do. What does this mean for us in Richmond. McKibben argues for local self-reliance. Producing as much of our own food and our own energy are strategies he endorses. I urge you all to read what really is a new bible for a new age. --upgrades to old Bay Trail sections in Marina Bay.